Julie Rada walked out of the “Emotional Baggage Drop,” a small, wood-paneled booth in the main hall at Denver Union Station, on Friday, having let go of some of her daily frustrations on her way to lunch. Organizers and supporters, including the Denver Theatre District and the roving art museum Black Cube, kicked off “Happy City” at Union Station just before noon Friday, touting a variety of whimsical, surprising, intentionally humorous features designed to connect strangers in public spaces. But major parts of “Happy City” — which began as an installation by acclaimed British artist Stuart Semple, and has expanded into a broader, more local project — will be impossible to miss. Besides “Emotional Baggage Drop,” which is designed to snag the thousands who pass daily through Lower Downtown’s transportation hub, “Happy City” in the coming weeks will roll out “Happy Clouds,” helium and soap bubbles combined to create giant, floating smiley faces released over the Denver Central Library, the Colorado Convention Center and other prominent locations. Massive digital billboards at 14th and Arapahoe streets, as well as at Champa Street along the 16th Street Mall, will screen bizarre, funny, surprising videos from artists such as Theresa Anderson, Milton Melvin Croisssant III and Zach Reini. Artist Carlos Frésquez will freshen up alleys off the pedestrian-heavy stretch of 16th Street Mall, between Stout and California streets, as part of “Between Us: The Downtown Denver Alleyways Project” (in this case, with giant, tree-shaped air fresheners), while artist Kelly Monico’s “Alley Cats” will install 300 kitschy cat figurines between Larimer and Market streets, and 14th and 15th streets. Those and other “Between Us” installations (from artists Joel Swanson and Frankie Toan) will open at 4 p.m. on June 15, with funding and production from the Downtown Denver Partnership and the Downtown Denver Business Improvement District. On Friday morning, Stell had just come from a fabrication shop that was preparing Semple’s piece “I should be crying but I just can’t let it show,” which will eventually become a bright yellow, smiley-faced foam “stress ball” big enough to be squished between two buildings (also opening June 15, between Champa and Stout streets along the 16th Street Mall). 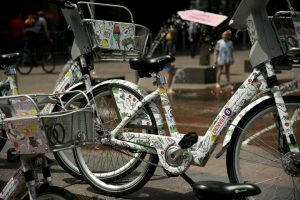 “The initial ideas resonated with a lot of people, and more locals wanted to get involved,” said David Ehrlich, executive director of the Denver Theatre District, which initiated “Happy City” with Denver-based partner and curator Nine Dot Arts. The entire, citywide installation, organizers said, has a budget of more than $500,000, supported by Theatre District funds as part of its ongoing Terra Firma project (including Konstantin Dimopoulos’ citywide “Blue Trees”) and other nonprofit and foundation support. A previously announced makeover of the Convention Center RTD Light Rail stop has been scrapped due to prohibitive costs. Dozens of people surrounded a “Happy City” table on Friday in Union Station, picking up event pamphlets and branded fidget spinners, T-shirts and other merchandise. Sage Hospitality is getting in on the act with art-themed overnight packages and installations at its downtown Denver hotels, including the Curtis, the Crawford and the Maven. Its historic Oxford Hotel will have a front-row seat for the “Happy City” piece “Jump (Bring Us Together),” which runs June 23 and 24 and brings an “inflatable dance party” (think of it as a massive bouncy house for adults — but with DJs) to 17th Street between Wykoop and Wazee streets. Hours are from 11 a.m. to 7 p.m.